Kristinn R. Thorisson recently appeared on RÚV news (Icelandic National Broadcasting Service) sharing his experience on doing research in collaboration with Honda on ASIMO humanoid robot, the most advanced humanoid robot in the world. For the past few years Kristinn R. Thorisson has been collaborating with the excellent team at Honda Research Institute USA and Communicative Machines in developing integrated cognitive architectures for humanoid robots; their developed Cognitive Map Architecture (PDF) which, for example, enables ASIMO to play board games with kids. The work relies on Psyclone, a powerful middleware that mediates between disparate modules; vision system, speech recognition, and spatio-temporal understanding mechanisms, as well as Asimo’s body. 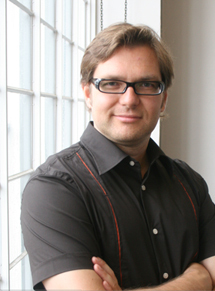 The software supports Thórisson’s Constructionist Design Methodology, which was the underlying approach to develop the Cognitive Map Architecture (PDF) which coordinates Asimo’s interpersonal behaviors. Find the video news clip on the website of the Icelandic National Broadcasting Service (Note: audio is in Icelandic). ASIMO is a humanoid robot created by Honda to help people who lack full mobility. It was first introduced in year 2000 and has been improved ever since. It can now run (at 9 kph), hop on one or both legs, and pour drinks. 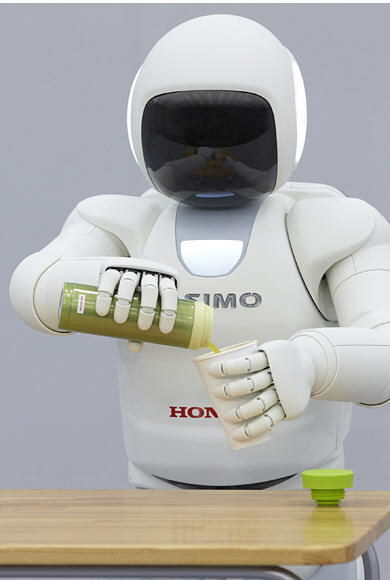 Find more information about ASIMO on HONDA’s official website for ASIMO.